Today we get more opportunities to get our our message than Elisha Otis ever imagined. But our recipients have far more distractions than those conventioneers in 1853 who assembled to watch Otis not fall to his death. writes Daniel Pink about Otis elevator´s pitch in 1853. 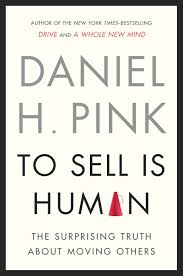 I have read another very interesting book from Daniel Pink: To sell is human. Once again, he surprises us with great concepts, ideas and references. This book is not only about traditional sales but, even more important, about non-sales selling. As he explains it, non-sales selling means “persuading, influencing, and convincing others in ways that don´t involve anyone making a purchase.” He cites as examples: teaching, coaching or instructing others, serving clients or customers. Educators for instance. But the best definition in my point of view, the one he uses that caught my attention and appears in the cover of the book, was that selling is about “moving others”. Take the business leaders for instance. We are moving people absolutely all the time. Moving them to make their best effort; to be committed to their work; to produce results; at least, to keep working for our company. To come up with innovative ideas, to champion the changes we need to implement. Moving others is what we do all the time in our offices! Not to mention in our personal lives: convince the kid to study harder for the exams, the husband to spend more time with the kids, the grandparents to stop buying expensive gifts for their grandsons, and yourself – to keep up with the diet and the exercise. As in his other books, he illustrates with great case examples and brings exercises, activities and references to help put the concepts into practice. His book is actually just the starting point, because you jump from one reference to the other and it looks endless. It is a delight to learn so much. Hope you enjoy it as much as I did.